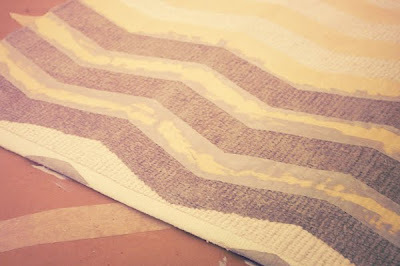 Painted chevron rugs? Yes, please! I've been wanting one for awhile, there's currently one at urban outfittersI opted for a more subtle zigzag, hoping it would lend itself to the calm feeling of our bedroom. 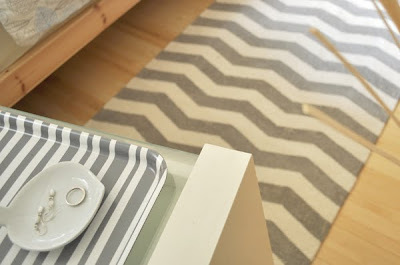 I picked up this little gray-striped tray at IKEA a few weeks ago, and as soon as I plopped the rug down beside the bed, I noticed they are nearly the exact same shade of gray, sweet! 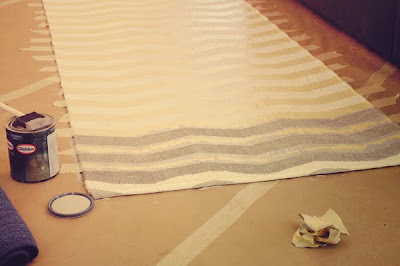 There are plenty of DIY instructions for this rug, (here, here, here, oh and here!) that have great how-to's so I won't write out detailed instructions, but here are a few during shots. 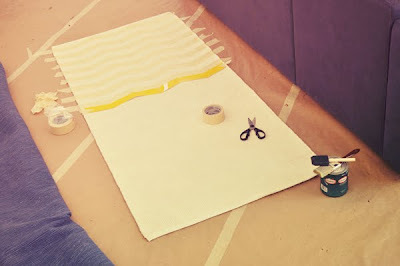 I used this IKEA rug and plain old masking tape instead of painters tape, just because it was what I already had. I also cut out a template to work from because I was intimidated by all the measuring that others mentioned. I just laid the template down and taped underneath it. 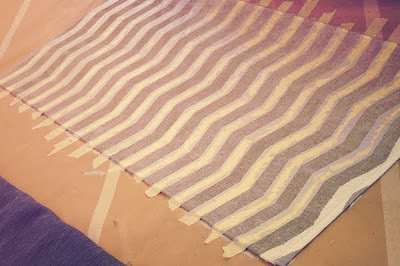 fabric rug. I had planned to remove the tape immediately after painting each row, but it went so quickly that I ended up removing it after I had painted all the rows. It took me about 45 minutes to tape out all the zig-zags, and a little over half-an-hour to paint the stripes. I let it dry for 1 hour before moving it to the bedroom - the paint did not bleed through the rug like I thought it might so I wasn't worried any smidges of paint getting on the floors and I let it dry overnight before walking on it. Seeing it underneath my feet when I hop out of bed has been making me smile everytime! WOW I need to come over more often. I love it! It looks great! I'm wondering though how it feels under your feet? Does the painted area feel "crisper" than the unpainted area, or did it soak into the rug enough that you can feel the carpet fibers through the paint?